Decorating a guitar doesn't change the sound but it does enhance the appearance of the guitar and this may contribute to the way the audience actually hears you. When Les Paul created one of the first electric guitars, it wasn't shaped like a traditional guitar and people did not respond to it well. 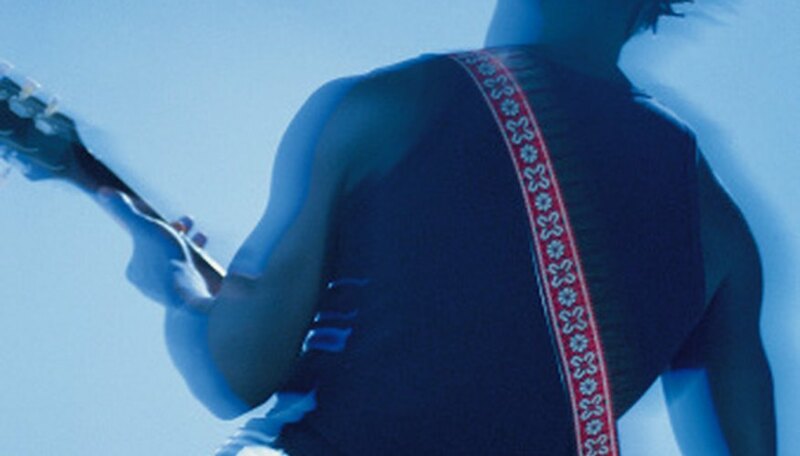 Paul realized that the visual aspect of the guitar plays an important role with a live audience. Eric's Clapton's psychedelic Gibson SG, from his days with Cream, inspired numerous guitar players to decorate and personalize their guitars. Decorate the guitar with decals and statements. This is the easiest and fastest way to personalize a guitar. Woody Guthrie was one of the first performers to decorate a guitar with a sticker. Guthrie's "This Machine Kills Fascists" sticker allowed Guthrie to make a political statement with his guitar before even playing a note. A replica of Guthrie's sticker is available from woodyguthrie.org for $3.00. Use your own creativity and taste in selecting stickers and decals for the guitar. Draw pictures, patterns, images and symbols on the guitar with permanent markers. Permanent markers are available at art supply stores in a wide assortment of colors. Sketch out the ideas for the design on a piece of paper. Once you are satisfied with the design, use the sketch as a model to decorate the guitar. Prep the guitar for a customized paint job. A customized paint job is a more labor-intensive and time-consuming project that requires prepping the guitar. Remove the guitar's strings and the hardware -- knobs, pickups and bridge. Removing the hardware on most guitars is easily done with a Phillips screwdriver. The pickup wires will have to be disconnected and re-soldered after the job is finished. The guitar neck may either be removed or protected with blue painter's tape. Sand off the old paint with 60 to 80 grit sandpaper. Wear a mask during the sanding process. Continue sanding down to the bare wood. Once the old paint is completely removed, sand the guitar with 200 to 220 grit sandpaper until the surface of the guitar is smooth to the touch. Wipe the guitar down with a lint-free cotton cloth to remove the sanding dust. Apply a primer coat with an aerosol spray. Allow the primer coat to dry and then lightly sand the guitar with 1000 to 1500 grit sandpaper. Decide upon a paint design for the guitar. As in the previous step with the markers, it is a good idea to work out the design on paper before painting the guitar. Select a base color or colors. Decide if you want stripes -- like Eddie Van Halen; psychedelic imagery -- like Eric Clapton; or your own unique design. Paint the guitar with acrylic paint. Buy acrylic guitar paints at paint supply stores and online. Apply the base color with an aerosol acrylic paint. Hold the nozzle 8 to 10 inches above the guitar and apply the paint smoothly and evenly. Allow the paint to dry completely for 24 hours. Paint the more intimate details with fine bristle paint brushes. Apply one to two coats of clear polyurethane to the guitar to protect the new paint job. Hold the nozzle of the can eight to 10 inches above the guitar and apply a smooth and even coat. Allow the first coat to dry completely. Apply a second coat for extra protection.